Ballet Co. Laboratory begins its inaugural spring season with Gentle Human April 6th and 7th at the Cowles Center for Dance and the Performing Arts. This new contemporary work choreographed by Zoe Emilie Henrot, instills themes of strength, grace, and female power that are relevant in every person’s life. Gentle Human is a vulnerable exploration of human emotion as a reaction to adverse outside forces. Inspired by true events in the lives of the company dancers and the wise words of Nikita Gill’s poetry in her book, Wild Embers, Gentle Human is a portrait of young artists finding meaning against the odds. The company of Ballet Co. Laboratory is a family of dancers who suddenly found themselves removed from the dance community they knew; so they built one for themselves. Out of a time of tumultuous uncertainty, they were able to look within and find the origins of purpose and belonging. 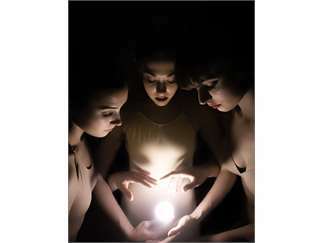 The dancers saw in themselves untapped potential and seized an opportunity to rise, to reevaluate, and to renew. Audiences can connect with the experiences and emotions that come with difficulties society often faces. This performance illustrates a reflection on the internal and external conflict of light versus dark and how we treat ourselves and those around us.